Issue 37 remains one of CH’s most requested, and for good reason: It admirably sketches where the early Christians worshiped, how they prayed and sang, what they borrowed (and did not borrow) from the worship practices of their pagan neighbors, and how they baptized (with “high drama”) and celebrated the Eucharist (frequently and fervently). In it you can read the words of many of those early Christians—among them Justin Martyr, Tertullian, Cyprian, Hippolytus, Cyril, Perpetua, Clement of Alexandria, and the unknown authors of Christianity’s earliest known church order, the Didache—describing the ways in which Christ’s presence was made real to them in the worshiping community and sustained them in the face of persecution and martyrdom. Also with good reason, issue 37 concludes with the legalization of Christianity in the early fourth century. But Christians did not cease worshiping “in spirit and in truth” when their faith was legalized, only to begin again in the Reformation, in the eighteenth century, or even in the present. We do a disservice to so many in our own Christian family tree when we pass lightly over more than a thousand years of their prayers, songs, processions, sermons, statues, mosaics, baptisms, and eucharistic celebrations. During the millennium and more between Constantine and Luther, Christianity moved from the margins to the center, becoming the church of the powerful as well as the powerless. It rose with stunning rapidity to become the dominant faith in the landscape of old Rome and emerging Europe. Yet Christianity never stopped trying to come to terms with its earthly power, nor seeking out new ways to worship Christ, who had called it into being. 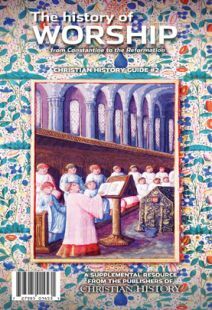 In this guide to Christian worship from the fourth to the fifteenth century, CH travels through those years to discover exactly what Christians were up to as they met on Sundays, on feast days, and for daily prayer. What did preachers preach about? What Scriptures were read? What did choirs and congregations sing? Who led worship in the front of the assembly? In fact, where was the assembly worshiping in the first place, and what did the buildings look like? How did services vary from place to place, and what parts of the service never varied? What did people think a sacrament was, and how many of them were there? Who took Holy Communion, and when? You will hear saints of the church from Augustine to Francis of Assisi, Ambrose to Bernard of Clairvaux and Benedict of Nursia, John Chrysostom to Peter Lombard, reflect on who Christ is and how we best worship him. You will read a nun’s diary, walk through worship with a pope, and stand in the back of an English church in the shifting light and shadow filtering through Gothic windows. This guide will take you through this wealth of material in two ways. First, there are five topical articles on words, sacraments, worship leader-ship, church music, and church architecture from 400 to 1400. Read these to gain an overview of what worship looked like—what stayed the same, what changed, and why. Three “snapshots” are interspersed among these: Jerusalem in the fourth century, Rome in the eighth century, and England in the fifteenth century. These will help you see how Christians worshiped at some specific moments along this journey. The articles in this guide focus on worship in Western Christendom as the empire begins to divide. Future guides may look at Eastern and post-Reformation worship. Jennifer Woodruff Tait, a frequent contributor to Christian History, teaches history at Asbury Theological Seminary, Huntington University, and United Theological Seminary. Her doctoral degree at Duke University and master’s degrees at Asbury Theological Seminary focus on the history of Christian worship. Dr. Woodruff Tait’s book The Poisoned Chalice: Eucharistic Grape Juice and Common-Sense Realism in Victorian Methodism was published in 2011 by the University of Alabama Press.